If you'll permit some of that navel gazing that bloggers are famous for, I'd like to spend some time bloviating about how this blog gets written. Before you start screaming and throwing little pickles at me, I'd also like to note that I'm not the only one who has done this before. A couple years ago*, Ed from The Dogs of Beer wrote a similar post, and it set off a series of other posts from other bloggers. Yes, it's all naval gazing to an extent, but I have to admit that I enjoyed reading about how other folks in the fraternity of beer bloggers construct their posts. I've been doing this for a little over three years now**, and have settled into a comfortable groove... that doesn't appear to resemble anyone else at all. Not least of which because at least two of these people appear to be awake at 7 am, which is totally crazy town. I'm a night owl, and do most of my blogging after 10 pm (if not later). But let's not get ahead of ourselves. The process begins with... beer! As you might imagine, we have a large procurement department, so we're always scouring the area (and social media) for new beers, bottle releases, and the like. I won't bore you with the details, but suffice to say, my eyes are bigger than my liver, and thus I almost always have a large quantity of interesting, blog-worthy beer on hand at all times. What is blog-worthy, you ask? Initially, my plan was to write about every beer that I drank. Right now, this is a more difficult question, but lately, they tend to be beers that require some effort to acquire and/or understand. Maybe they have a good story behind them. Maybe I'm new to the brewery. Maybe I went out of my way to snag it and want to justify the extra effort. Maybe it's a style I'm not that familiar with. Or, who am I kidding, maybe it's spent some time in a barrel of some kind. So any given post is generally initiated on the weekend. I tend to only really review beer that I drank alone, mostly because if I'm drinking with friends, I don't want to be rude and bury my nose into my phone whilst I tap in some detailed notes. There are occasional exceptions, and sure, I might take a picture and check in on Untappd, but for the most part, I'm drinking at home on Friday or Saturday night. My goal these days is to drink no more than 3 blog-worthy blogs a week (and less is fine, though that usually doesn't happen). I crack open a bottle, pour it into my glassware of choice, and snap several quick pictures with my phone (believe it or not, the pics that show up on the blog are usually the best, most clear pics). 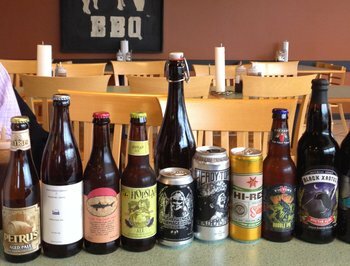 I go through the beer nerd tasting routine. Appearance, smell, taste, mouthfeel, rinse and repeat. As I'm doing this, I'm taking notes on some sort of computing device (desktop, laptop, tablet, they all work). Most of the tasting notes are written in the first 5 minutes or so, though I will usually revisit as I'm finishing up the first glass, just to make sure that, for instance, a sweet beer didn't get cloying, or to note how the beer changed as it warmed up. If I'm particularly inspired, the research phase of blogging will start while I'm drinking as well (but always after the tasting notes are practically done). This mostly consists of lazy googling, and generally ends quickly, as some shiny new object catches my attention on the internets. On rare occasions, an idea for a post will crop up around now. At the end of a given weekend, I'll have a few sets of tasting notes. My ideal schedule is to post something on Monday, Tuesday, and Thursday (aligning with the three blog-worthy beers I had that weekend). 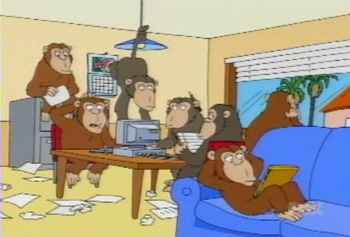 As I mentioned earlier, other bloggers seem to start their process in the early morning, which is crazy talk here at Kaedrin HQ. Most of the time, I'll start my research phase (that fancy phrase for googling) after I've had my dinner and am lazing around for a bit. At this point, I should also point out that Kaedrin employs a crack squad of chain-smoking monkey researchers for much of the tedious detail work, and they're very thorough. What I'm really looking for is an angle for my post. I'll occasionally come up empty and just bang something out in a few minutes, but most of the time I'm able to find something I can hang a post on. A brewery profile, a pedantic style discussion, an even more pedantic exploration of the brewing process, historical notes, personal digressions, and so on. In rare instances, I'll be inspired to write something in Screenplay form, or maybe do something off the wall, like a Choose Your Own Adventure Beer Reviews type post. After three years, some of these topics are starting to get a bit thin. You can only wax philosophic on a given beer style so many times before you start repeating yourself. In any case, I haven't started writing yet. I'm just researching and formulating. Instead, I head down to my basement and exercise (gotta work off those beer calories somehow, amirite?) and this is where the idea for a given post really starts to form (or, uh, fall apart). Exercise is all about tedious repetition, so it's good to have something rubilating in your head during that time. Once I finish exercise, during my "cool down period" I try to bang out a first draft. I may or may not be successful at completing this, but that's when the writing starts. I'll once again, take a break and shower off (so I suppose I do get ideas in the shower sometimes), after which I fire up Spotify and go into full blown panic mode, and crank out the rest of the entry. Once a draft has been completed, I need to take a few minutes to get the picture ready (cropping, resizing, etc...) and categorize the post (look at all those categories over there on the right! ), which again gives my brain a chance to think about something else for a minute. Then I edit the post. This consists of four primary activities. First, fixing grammar and typos and whatnot. Maybe adding a link here or there that I forgot whilst I was writing. Boring stuff. Second, I tend to be longwinded, so I am almost always removing something I wrote in order to make the post flow better. I'm almost never successful in this, and often produce bloated posts (like this one! ), but I do try. Third, I clean up the tasting notes a bit, and try to add some levity. I write technical documentation in my day job, so I find my tasting notes tend to feel kinda... samey. That might make them boring to read, but they do tend to at least be consistent. But if I can get a zinger in there, all the better. Finally, I make a conscious effort to bring the funny somewhere in the post. The results of this process are dubious at best and I will often rely on lame pop culture references or the infrequent meme, but again, I'm at least trying. On the other hand, I'm genuinely proud of the stupidity of the meme I made on this post, and I do love making obscure pop culture references that few people will ever understand. And that's just about it. Publish the post, and obsessively check my stats, which are pitiful. The actual writing of the typical post usually takes 30-60 minutes, though longer, more creative posts obviously take more time. Go figure! One interesting thing I've noticed lately is that writing about new beverages has really opened up options for the angle of approach. There's usually something interesting about the beverage itself, but even if there isn't, I feel like writing about a given beverage with a beer nerd's perspective makes for some interesting observations. Perhaps I should continue writing about these other beverages, if and when the opportunity presents itself. Well, I hope this was enlightening and yep, I'm pretty sure no one is reading by now, but hey, it's all good. This was fun. We should do it again sometime. In any case, this weekend is seeing the first non-alcoholic beverages that will be blogged about here, though I think I'll also hit up some rye whiskey too. The following weekend will be tea, followed by Scotch... and then my 40 days are up, and I'll be back to beer with a vengeance. So far so good. * We like to be timely here at Kaedrin, which is why we usually post about current events and topical stuff about a year or two later. ** Though I will also note that I've been blogging over at my generalist blog for almost 14 years, so take that. My short yet Grand Detour (pun intended!) 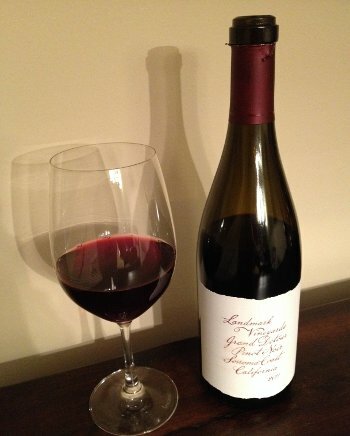 to the swanky world of wine continues with this well-regarded Sonoma Pinot Noir from a veteran producer. As mentioned yesterday, I know very little about wine, so to make this choice, I relied heavily on the fine folks over at PA Vine Company, who reviewed this a while back and clearly steered me in the right direction. Once again, please excuse the beer nerd simplifications I'm about to subject you to, I'm just not as familiar with this world as I am with some of the other detours I've been taking lately. Pinot Noir is a red wine grape originally associated with the Burgundy region of France, though it's obviously caught on elsewhere, notably in northern California and the Willamette Valley in Oregon (also known to beer geeks everywhere as home to some of the finest hop farms in the country). By all accounts, Pinot Noir is a finnicky variety, thriving in cooler climates, but sensitive to wind and frost and vulnerable to several viticultural issues. Wikipedia has a great quote from a famous winemaker saying "God made Cabernet Sauvignon whereas the devil made Pinot noir." Well, to be fair, it seems that the devil knows his stuff, as Pinot Noir is very popular. While it is difficult to cultivate, it can yield some of the "finest wines in the world." I'm also told that it is highly reflective of its terroir, sometimes producing very different results depending on the geography and weather. All of the pinot noir grapes are hand-harvested into half ton bins and sorted in the vineyard. They are then re-sorted at the winery to ensure only the perfect clusters make it to the wine. The clusters are destemmed with 15% left whole cluster, which imparts a complex structure and spicy notes to the wine. The must is then cold soaked for five days in open top fermentators to enhance the color and flavors. That last bit caught my eye, as it sounds like a spontaneous fermentation. Indeed, the label on the bottle sez that it is fermented "using only wild yeasts." To the beer nerd, this screams Brettanomyces, something I know winemakers consider an anethema (cue stories of winemakers refusing to visit the Russian River brewery for fear that hardy Brett beasties will attach themselves to clothing and hitch a ride back to the winery, where they can infect the wine with reckless abandon). Of course, that's not strictly the case, as it appears that some vinyards often try to cultivate more favorable wild yeasts, including "ambient Saccharomyces" and the like. I have actually wondered if there were any winemakers who dare to play with Brett. It seems that some beer brewers are able to tame it, but then, there is certainly a consistency issue with those beers. Wine Nerd Details: 14.2% ABV bottled (750 ml corked, slightly higher than cellar temp). Drank out of a wine glass on 3/22/14. 2011 Vintage. 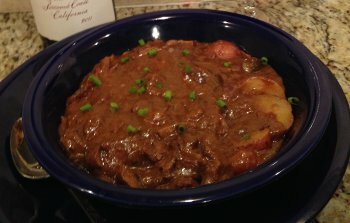 Food Pairing: I made one of my favorite winter dishes (a little late in the year, to be sure, but cut me some slack, it's still in the 30s this week), Beef Bourguignon. I tend to not follow that recipe exactly (for instance, usually less beef, more mushrooms, and a few other proportions are off), but you absolutely need to do the overnight marination step, and for this particular batch, I used a cheap bottle of Pinot Noir I had laying around (it was a 2012 Cartlidge & Brown). I even made a Vine of the process, if you want to watch some hot wine on beef action. The dish turned out very well and the Cartlidge & Brown worked well (this may not be the best batch I've made, but it is a damn sight better than that time I used a Coppola Malbec, which was clearly not up to the task, though it's not like it was inedible or anything). Anyway, it was a nice dish to pair with the Landmark Pinot Noir. 5 stars, would do again. Beer Nerd Musings: While not the same thing, I sensed a very strong correlation with this Pinot Noir and oak-aged Flemish Reds. I kept thinking how this reminded me of various Rodenbach expressions (mostly the Grand Cru or Vintage versions, not so much with the Caractère Rouge), though obviously stuff like Red Poppy and Oude Tart are similar. I mused yesterday that sours might be a good entry point to good beer for wine lovers, and indeed, I think that the easily found Rodenbach Grand Cru would be an ideal choice for that purpose. As you might expect, there's no shortage of beers aged in Pinot Noir barrels. Like with the Chardonnay barrels mentioned yesterday, these often skew sour. Notably, my favorite Russian River sour, Supplication, is aged in old Pinot Noir barrels (along with cherries). Well worth seeking out (and if you're looking for a pairing, it goes exceptionally well with BBQ brisket, ribs, and the like). To my mind, Pinot Noir seems to also work equally well for non-sour beers too. Deschutes likes to blend small proportions of Pinot Noir aged beer into The Abyss (a big RIS) and The Stoic. Local brewers from Dock Street used Chadds Ford Pinot Noir barrels for their barrel aged Barleywine and Imperial Stout, to great effect (they had a fantastic barrel character, but I should say that I wouldn't have picked them out as wine barrel aged). So that just about wraps up the wine I'll be writing about, though there's still a few weeks left in my little detour from beer, and who knows where that will take me. This is a beer blog, but as explained recently, I'm going to be spending some time getting to know other beverages. So far, I've covered Bourbon and Port Wine, both of which I'm reasonably familiar with. What's more, they are both reasonably approachable in terms of what they are and what is available. Last weekend, I pulled the cork on a few wines, which is probably the subject I'm least familiar with. It's not like I've never had wine before or anything, but I've never really nerded out on wine the way I have on beer, and looking at it now, it's a bit overwhelming. To drastically simplify Bourbon, it's all about the malt bill and age. Port Wine has elements of terroir and grape selection, but is also very much about the aging process. Wine appears to be all about the grapes and the terroir. As a beer guy, Bourbon and Port Wine are approachable, but Wine's focus on terroir is somewhat new territory. To be sure, there is terroir involved in beer, most notably with hops. Once again I find myself reaching for a simplification, but if you plant the same hop in different places, you will get slightly different results, and the terroir matters too (a good year in the US Pacific Northwest may not be very good for UK or Czech Republic or New Zealand). Indeed, a couple years ago Victory planned an event called Terroir des Tettnangs, wherein they took their Braumeister Pils recipe and made five batches using German Tettnang hops. The only variable that changed in each of the five batches: the specific field in which the hops were grown. I had a couple of these and, sure, there were not dramatic differences, but there were differences. And one only need look at the US focus on citrus and pine hops, as compared to the more woodsy, earthy, herbal, spicy hops of Europe or the juicy tropical fruit notes in New Zealand and Australian hops (again, dramatic simplification here). Wine Nerd Details: 13.6% ABV bottled (750 ml corked and chilled). Drank out of a wine glass. 2012 vintage. Beer Nerd Musings: I've already gone off on beer terroir, so I'll note that there are many beers aged in old Chardonnay barrels. Most of these tend to skew to the sour side, as barrels provide a good environment for the wild yeasts and bacterial beasties that are key to those beers. A great example that is usually available in the Philly area is Russian River's Temptation, which is delicious. Some of Cisco's Lady of the Woods occasionally makes its way down here as well, and that is well worth seeking out. There are some beers aged in Chardonnay barrels that don't go the sour route, like Victory's White Monkey, which is solid, but perhaps not really my thing. One other thing I'll mention is that it took me a while to get into sour beer, but on the other hand, I seem to have great luck blowing people's minds with sour beer at beer club. I suspect sour beer would make a good entry point to the world of beer for wine drinkers. So there you have it. Stay tuned for a look at a rather nice Pinot Noir (both in my glass and in my meal). Do you have a lot of money? Then Vintage Port is for you! I took a flier on some 2011 Vintage Ports, but man, they sure do put a hurting on the wallet. I can't say as though it's something I'll be doing very often, but then, it's still an interesting aspect of this pursuit. As mentioned earlier this week, Vintage Ports appear to be the pinnacle of the Port world, hence the expense. A Vintage Port is made entirely from the grapes of a declared vintage year. Only 3-4 years in a decade, on average, are declared vintage years and the decision is made by each individual port house (or "shipper"). The decisions do not come lightly, and they generally seem to group together. The decision to declare a Vintage is made in the spring of the second year following the harvest. Last year, the decision was made to declare 2011 as a Vintage year, and all signs point to this being a classic Vintage that could rival any of the past 20 years, if not further back than that. As mentioned in my earlier post, Vintage ports are released relatively young, but they are meant to age in the bottle, and will last decades. 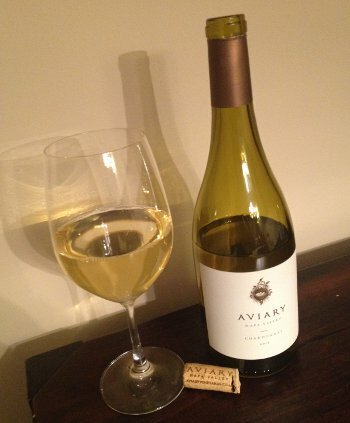 They say the 2011 Vintage is ready to drink right now, but will continue to evolve over time. There are also Late Bottled Vintages (LBV), which are still from a single year, but come later in the aging process, and thus don't quite have the same quality of Vintage years. There are different ways to treat these wines, but filtered LBV Ports are meant to be drunk right away, while unfiltered LBVs can lay down for a while, just like Vintage ports. LBV ports tend to be much more cost effective, from what I've seen, but then, the quality is clearly not as high as Vintage Ports. 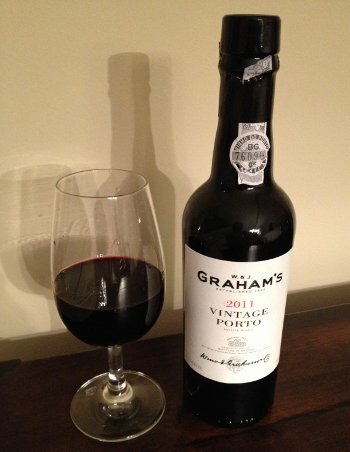 What we have here is Graham's 2011 Vintage Port, generally regarded highly by Port nerds (at least as far as I can see). 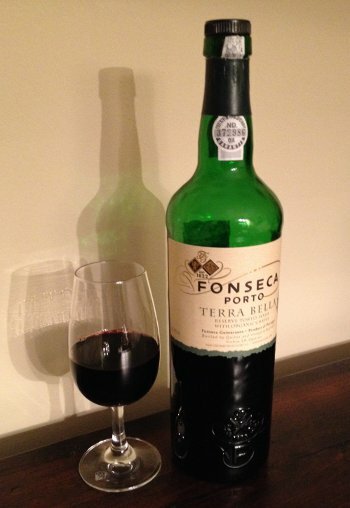 It was certainly very expensive, but it at least came in a small 375 ml bottle that is at least approachable to tackle in a relatively short timeframe (it will certainly last a long time, like all port, but it apparently loses its distinct character after you've had it open for a while). Vintage ports are unfiltered, so I did need to decant this first. I saved the dregs of the bottle for use in my upcoming Beef Bourgogne recipe, which will hopefully impart a little extra zing. Wine Nerd Details: 20% ABV bottled (375 ml with cork). Drank out of a copita glass. 2011 Vintage. Beer Nerd Musings: As I mentioned previously, there are beers aged in Port barrels, though I don't know of any that are specified as Vintage port barrels, which would be interesting. One of the things I've been wondering about barrel aging is how the age of the barrel impacts the secondary use. Would a Vintage port barrel (with 2 years primary use) be much better to use than a 30 year Tawny Port barrel? I suppose the same could be said for Bourbon barrels, and it may be something I pedantically pursue by emailing brewers when I get drunk. Only one way to find out, I guess. So that concludes this weeks' Port festivities. I believe this coming week will stay in the wine world, with a white and red, though who knows how this weekend will strike me. See you next week! Kaedrin Fat Weekend IPA - This year's batch finally got that Simcoe and Amarillo loving that I've been trying to get for a few years. My only issue is that I'm still getting a handle on this kegerator operation here, so I feel like I frittered away a significant amount of aroma in the process of trying to get the carbonation and pressure right. I think I've figured out this process well enough that I won't ruin future batches, and it's not like this one turned out bad or anything. Indeed, just a few of us housed 3 whole growlers during Fat Weekend (we would have done so on Friday night if I didn't insist we save one for Saturday). So yeah it was good, and it compared somewhat favorably to tonight's IPA lineup, which was considerable. I'll give it a B for now, though I think it could easily go higher with some slight tweaks to recipe and kegging procedure. Sixpoint Hi-Res - Alright, so we're getting to a point where specifics about given IPAs are starting to blend together in my head, but I my thoughts on this one are that it comported itself very well in this rather strong lineup of IPAs and DIPAs, actually better than I was expecting (though I'm not sure why, as Sixpoint has always been a pretty solid brewery for me). We'll go with B+ and leave it at that. Alchemist Heady Topper - Yeah, we've already beaten this one to death before on the blog. Bell's Hopslam - Another one we've covered before, but I certainly ain't complaining, as I do really enjoy this beer and this is the first time I've ever had it out of a bottle. Thanks again to Dana, who brought a crap ton of DIPAs tonight. While the terroir and grapes used are important (and there are multiple varietals), the bigger lever in the Port world appears to be how it is aged. I'm totally going to screw this up, but what you've got are basically Tawny Ports and Ruby Ports (and I guess I should include White Ports, which are made with white graps). Both are typically aged in wooden barrels, but Tawny Ports will age for much longer and often come with an Indication of Age (a term of the art, with official designations 10, 20, 30, and 40 years). Aging in barrels exposes the wine to a long, gradual oxidation and evaporation, leading to a loss of color (typically settling into a golden brown color) and differences in flavor. Because the aging is done in the barrel, the bottle is usually ready to drink when you buy it. Ruby Port, on the other hand, typically spends a shorter amount of time in the barrel and is meant to age in the bottle. To be sure, most Ruby Port is not necessarily meant for extended aging, but there are many sub-categories here. Ruby, Reserve, Late Bottled Vintage (LBV), Vintage, and several others exist. We'll cover LBV and Vintage in a separate post, but Vintage port is supposedly the finest Port you can have. Ruby is typically a blend of very young Port, simple and fruit-driven flavors. Reserve Port is a blend of Ruby Ports with an older average age and thus added complexity and quality. The idea is to approximate some of the character of Vintage port through blending. Wine Nerd Details: 20% ABV bottled (750 ml cork stopper). Drank out of a copita glass. Beer Nerd Musings: I was originally turned on to Port Wine because some beers, particularly very high ABV beers, are often described as having a Port Wine character to them. In specific, Dogfish Head's World Wide Stout, an 18% ABV monster imperial stout, was described by Sam Caligione as having "port notes" which I noted at the time made me want to check out the world of port. And here we are a few years later, and I can certainly discern a port-like character in some beers, particularly high ABV, malt-forward barleywines, which often take on a vinous fruit character (even though there are no grapes used in their production), some examples being Dock Street's Barleywine and Hoppin' Frog's Naked Evil, though you'll often see fruity notes mentioned in barleywine reviews. Stouts are a little more rare, but the very high ABV ones like the aforementioned WWS and Brewdog Tokyo. So there you have it. A small glass of Port Wine has become a Kaedrin nightcap standard, and it's often a nice way to follow up some beer. Oh, and it's good on its own too. Stay tuned for Beer Club tomorrow, followed by some Vintage Port on Thursday. Beer has four main ingredients: water, malt, hops, and yeast. There is a tremendous amount of variation in all four ingredients (water being the most unassuming, though there are examples of famous beers that get distinctive character from water, notably beers from Burton on Trent), so whenever I venture out into the world of wine or spirits, I feel a little lost. Where are all the ingredients guys!? With bourbon, most of what people talk about is the mash bill. Bourbon has to be at least 51% corn, but there's a lot of variation in that other 49%. Rye and wheat are common, and barley is also used. While it's common to pick out yeast character in beer, it's rare to you hear someone talk about that sort of thing with bourbon. However, there has been one exception that I've found, and that's Four Roses. They have two primary mash bills... and five different yeasts. So they have 10 different recipes, all of which are blended together to make the standard "yellow label" Four Roses. Individual variants often show up in single barrel offerings or small batch blends. Bourbon Nerd Details: 100 Proof, 50% ABV bottled (750 ml). Drank out of a copita glass. Bottle is at the half-way point. Beer Barrel Potential: Sign me up, this Bourbon has that nice balance and I suspect the classic caramel, vanilla, and oak combo punch would fit the standard BBA styles. 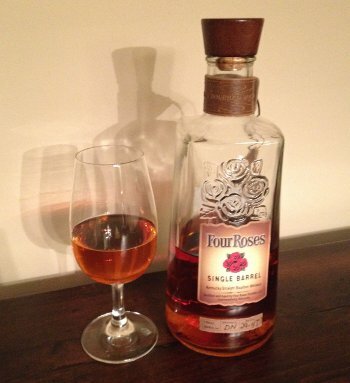 There are several famed beers that are known to be aged in Four Roses barrels. FiftyFifty Eclipse has a Four Roses variant and Cigar City used Four Roses with their straight up BBA Hunahpu's Stout (though this year's fiasco involved rum and brandy barrels, with no straight BBA treatments). Alas, I've had neither of those. Four Roses is, of course, part of a lot of other famous barrel aging programs, like Firestone Walker's and Goose Island's (I've heard rumors of a special Four Roses variant of BCBS, which, you know, sploosh). * Tiresome because there's no head, or because I keep making this bad joke over and over again? Take your pick! Alright, fine, it's the latter, I admit it. It's time to play Acronym soup. 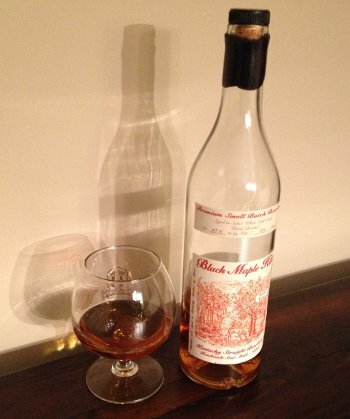 Black Maple Hill, or BMH, is what's known as a NAS NDP Bourbon. I gather that these are not normally good acronyms to have attached to your Bourbon, and yet this sucker seems to be highly sought after. Let's break it down, shall we? NAS means Non-Age Statement, meaning that the bottle does not indicate how long the bourbon was aged in barrels before being bottled. I don't want to start a holy war here, but while most higher end bourbons tend to be 6 years or older, there's a popular notion that the older a whiskey is, the better it will be. This is probably not the case (I've heard that 6-10 years is the sweet spot, but then, tastes vary, and some folks lover their old bourbon), though obviously older bourbon is more scarce and thus probably more desirable. Those in the know seem to put BMH in the 8 year or so range, but then, how would we really know? It's labeled as "Straight" bourbon, which means it's at least 2 years old, though that's not really much help. Purists don't like NAS stuff, especially when something used to have an age statement and then dropped it. There's no real corollary to beer here, as most beers aren't made to age, though I guess we could talk about packaging dates on bottles, which to beer purists can be very important for styles like an IPA (except in this case, freshest is best). NDP means Non-Distiller Producer, which basically means that Black Maple Hill is not actually a distillery. There's a company in San Carlos, CA that pays Kentucky Bourbon Distillers (KBD) to make a blend, then slaps a (rather beautiful) label on the bottle and sells it as his own. KBD doesn't actually make the whiskey either, they just purchase stocks from actual distillers, blend it, and bottle it. The knock against NDP bourbons is that you generally have no idea where the bourbon actually came from, and in the now-booming bourbon market, supply is becoming constrained. Rumor has it that Heaven Hill supplies KBD and thus BMH, but who's to say how long that will last or if it's even true in the first place? Again, purists tend to look down on this behavior (unless the NDP does claim specific provenance, like when Jefferson's does bottlings of Stitzel-Weller juice). I liken this to the stigma attached to contract brewing in the beer world. There are, of course, exceptions (especially since craft beer has really taken off), and there's the fine line between Gypsy Brewer and Contract Brewer, but NDP seems a little more shady to me. So when you combine NAS and NDP, you see something that's not very appealing to purists. Not that it stops people from buying the stuff. Supply is apparently constrained all over the country, and people are asking if it's the next Pappy (regularly referred to as the "best" and thus impossible to find). Me, I strolled into a PA state store and picked one up right off the shelf. I'd heard of it, and knew it was popular, but didn't really know any of the above. I suppose I was lucky too, as it's not something I've seen since then. So why the hype? Near as I can tell, Black Maple Hill is one of the older NDPs that are still putting out bottles today, and their early stuff was supposed to be legendary. Before the current boom in whisky, distillers had a glut of unsold bourbon and so NDPs had no problem sourcing good stock. Indeed, early BMH was bottled by Julian Van Winkle III himself (for the uninitiated, Van Winkle could probably bottle his tapwater and sell it for $100 a pop), but that connection is long since gone. Perhaps the glowing aura of Van Winkle really does cast a long shadow, or maybe scarcity is what's driving demand. Oh, and people seem to really like it to. There's also that. Like I always say, it's what's in the bottle that counts. That being said, I was unimpressed. This is the opinion of an admitted newbie with little experience in the area, so take that with a huge grain of salt, but I have to admit that I preferred several other bourbons to this (and those were all much cheaper than this too). Bourbon Nerd Details: 95 Proof, 47.5% ABV bottled (750 ml black wax, orange label). Drank out of a snifter on 3/7/14. Bottle is almost gone at this point, but the above notes are representative of earlier tastings. Beer Barrel Potential - I have to admit that I have no real basis for answering this question, but it's an interesting one and I like engaging in wild speculation. Again, take this with a huge grain of salt. So would the barrels used for BMH be good for a secondary use with beer? The only thing I'd worry about is that the corn forward note wouldn't stand up to a big imperial stout (9% ABV stouts might work better, but still). Barleywines might work well though, and maybe something like an Old Ale or Scotch Ale would work too. To my knowledge, no beer has used BMH barrels, but given the unclear provenance of the juice, who knows? Heaven Hill is certainly a big supplier of barrels to brewers (including heavy hitters like Goose Island, Firestone Walker, and the like). So there you have it, my first bourbon review. Next up on the bourbon train is Four Roses, see you Thursday. In the 1930s, folks became very worried when their favorite radio programs were interrupted by special news bulletins. News back then tended to include things like Depressions and Nazis, so that was a pretty reasonable reaction. These days, the phrase "We interrupt this program..." is a pretty harmless declaration used half ironically to state things like how I'm not going to drink that much beer for the next six weeks or so. Fear not, this is but a temporary situation, undertaken on a whim. Blogging will continue, very possibly at the same 3-4 post per week rate (but let's not count on that, mmmk? ), though it will not all be about beer (more on this later). Blasphemy, I know, but I've actually been looking forward to this for a while. And lord knows this isn't a particularly strict regimen I'm going to engage in here. Fat Weekend is coming up in a few days, and all bets are off there (but then, Fat Weekend was never particularly good material for blogging anyway, seeing as though I'm too busy yucking it up with the famed quorum of portly gentleman I don't get to see as often as I used to). And the following Wednesday is beer club, which is still on. But the bulk of my beer drinking, which tends to occur on weekends, will be on temporary hiatus. There are several reasons for this, all of which are self-imposed and not the result of any particular problem. First, I probably drink too much. I know for a fact that I drink a lot less than other folks, but that doesn't mean I don't drink too much either. The other day, I was heartened to answer "0" for the first three questions in this essay, but there are plenty of times when my answers would be much worse and the phrase "I don't have a problem" still seems problematic to me considering how much beer I've drank (at a pretty steady pace) for the past 5 or so years. And if you read this blog, you can see that I don't exactly shy away from the high alcohol brews. So I'd like to prove to myself that I'm not a slave to my favorite beverage by not drinking it for a few weeks, if I can manage that. Second, the health component. While I absolutely savored every damn dromp of that Bruery Mash last week, it occurs to me that a bottle of 12.5% ABV barleywine represents at least 700-800 calories, which would be a non-trivial portion of my diet on a normal day. A few years ago, I came close to hitting 200 lbs and realized that I wasn't 23 anymore, so I started eating better and exercising more. I'm actually much healthier now than I was back then (and am down into a more svelt 170-180 lb range), but I again find myself thinking "I don't have a problem" and that attitude worries me sometimes. So let's try this little experiment and verify that, shall we? While I'm on the subject of health, I'd like to air out a pet peeve I have about beer boosterism. I follow a lot of beer blogs and keep pretty close tabs on twitter, so I see my fair share of "Beer is healthy for you" articles, and it kinda drives me up a wall. Yes, some studies have shown that, for instance, alcohol can help boost HDL Cholesterol (aka "Good" cholesterol) but the thing that most of us conveniently downplay is that those studies are about "moderate" consumption. Guess what? I don't think Bourbon County Brand Stout counts as "moderate", nor does taking down a couple Hopslams. What's more is that while alcohol can have a good effect, it's rarely the best way to get that effect. If you want to raise your HDL, exercise, eat better, and lose some weight. I bet your doctor won't actually recommend to increase your booze intake. There are other benefits of moderate consumption and plenty of things specific to beer, but it's probably best to be wary of something that your body treats like poison. Obviously I love me some alcohol (as evidenced by the fact that I'm not actually giving up on alcohol! ), but I think it's important to be clear headed about this stuff. No use in fooling ourselves. I've been particularly bad about my health of late. The Holidays are always rough, but then we kept getting snowed in, I got sick, and my elliptical machine broke. Most of these were basically excuses to stop exercising and drink more beer, which in retrospect was probably a bad idea. I don't feel any real ill effects or anything, but I have put on a few pounds and those jeans are getting a little more snug than I'd like, so I'd like to do a little course correction now before it becomes an actual problem. Third, sacrifice is a good thing. I grew up Catholic. Nothing particularly strict, but my family went to Church on Sundays and most of my schooling was through Catholic institutions. In case you didn't know, Lent started last Wednesday. I always hated Lent growing up, but as an adult, I've found it an invaluable way to break bad habits and/or try new things. 40 days is an excellent length of time to give something up. It's short enough that it's achievable, but long enough that your routine can be changed for the better. I suspect that even if I became a firebreathing atheist, I'd still find value in Lent (or do it some other way, like how some people had a dry January). Of course, as I mentioned earlier, I'm not giving up beer, strictly speaking. I know it's a cheat to give things up a week at a time, but to me, this is actually more about the health aspect. As I mentioned above, a little course correction is needed. And like I said, sacrifice is a good thing, and a little delayed gratification can be very rewarding. This is probably an unpopular sentiment in our age of on-demand everything, but screaming "Don't care how I want it now!" won't get you anywhere in life. Fourth and lastly, I want to explore other worlds. As a culture, we're leaning away from mass media. Oh sure, we've still got superstars and blockbusters, but the really interesting stuff is happening in the fringes and in the niches. Not a day goes by that I don't run across some absurdly specific, single-purpose website like Brides Throwing Cats or Stephen King's Boners. In its own way, this is a good thing, but then, there's no reason to isolate our beverages into siloed worlds that don't touch each other. For instance, I spend a lot of time obsessing over bourbon barrel aged beers, so why wouldn't I dip my feet into that bourbon world for a bit and see what its like? I think it would do a world of good, and give me some valuable perspective on the booze world. And, of course, nothing needs to limit this to alcoholic beverages. I plan to spend at least one week checking out some decent tea (despite Padraic's relative hiatus from blogging, I'm sure he'll be a helpful guide). Starting tomorrow, blogging will shift from solely beer-focused posts to include other beverages. This week, we'll be talking about bourbon. Next week, I'm thinking Port wine, though Fat Weekend may inspire me into a different direction. I plan to spend a week on wine, and another week on Scotch. There will definitely be at least one post on rye whiskey. And the aforementioned tea will get some love too. I figure I should be able to get a comprehensive understanding of these expansive worlds of booze in a single weekend, right? Well, no. All of these are beverages I already know and like (not starting from scratch here), but I would like to know more about them. To a certain extent, I've already progressed far down that path and will certainly continue far beyond these six weeks, but I've never really laid down the gauntlet. The primary reason I blog is to learn, and so here we are. I am an unabashed lover of beer and that hasn't changed, so I will naturally still be writing from a beery perspective, even if I'm writing about bourbon or wine or whatever. Hopefully these posts will still be interesting and maybe even enlightening. There's a reason this is a beer blog, but that doesn't mean we can't mix things up a little. I doubt many whiskey/wine geeks are reading this particular post, but if so, I should say that my tasting notes for your preferred beverage will be dramatically, frustratingly bad. I already know that my vocabulary for this stuff is horrendous, which is one of the reasons I'm doing this (again, I blog to learn). Plus, it's not like I'm ruling out any pure beer writing either. I've had a few ideas for posts bouncing around in my head for a while, and it's about time I sat down and knocked them out. Last weekend, I had naught but two drams of bourbon, and a couple small glasses of port as a nightcap. So perhaps not super healthy, but I haven't had a beer for a little less than a week (and it's not like I didn't follow up that Bruery Mash with a dram of bourbon, so I'm doing pretty well here so far). I've been getting back on track with my exercise regimen too. I feel good. This will be an interesting 6 weeks and hopefully you can join me on this beverage journey. Stay tuned, for tomorrow, we take a trip to Black Maple Hill. I've made no secret of the fact that I don't drink coffee and thus am not a huge fan of it in beer. Indeed, longtime readers (all three of you) are probably rolling their eyes right now, as I probably mention my apathy towards coffee too often. While I do feel like I've come around a bit on coffee beers and have had several that I really enjoyed, I usually still find myself wondering what it would be like without the coffee. Fortunately, that option is actually available most of the time, and in this case, the Bruery came up with an interesting experiment. I imagine the process of infusing coffee flavors into beer to be a complicated one with many variables that are difficult to control. What coffee are you using, how does it match with the base beer, when in the process are you adding the coffee, are you using the beans, the grinds, or actual brewed coffee (or some combination thereof)? Each one of those questions has a lot riding on it, so when the Bruery went to make a coffee-infused barleywine, they did some pilot batches and played around with a bunch of factors, but ultimately decided to release two beers: one unsoiled without any coffee at all (called Mash), and one with a very, very powerful coffee component (called Mash & Grind), the idea being that Reserve Society members will get bottles of each beer, open them at the same time, and blend them together to find their ideal level of coffee. Beer Nerd Details: 12.5% ABV bottled (750 ml capped). Drank out of a snifter on 2/28/14. Bottled 05/24/13. Not to beat a dead horse, but I'm really glad there was no coffee in this. I'm sure that if there was, I still would have enjoyed it, but it would been a "It's good... for a coffee beer" kinda situation. In any case, it wasn't, and I loved it, so there is that. Anyone want to be my Bruery Reserve Society proxy? It's a long shot, but I'm sure I could make it worth your while.